ASHLAND COUNTY, Wis. – A woman was flown to a Duluth hospital after her car struck an eastbound semi-tractor and trailer in the township of Sanborn. 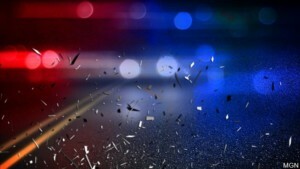 According to authorities the accident occurred around 5:14 a.m. on Wednesday morning on US Highway 2 just east of Goslin Road. Deputies from Ashland County Sheriff’s Office, Ashland Fire and Ambulance, and the Bad River First Responders were dispatched to the scene where they found a car driven by 58-year-old Melanie J. Sjolander had crossed the center striking a semi operated by 58-year-old Richard R. Kivi with a trailer loaded with 79,000 pounds of road salt. Both vehicles left the roadway after the crash and ended up in the north side ditch of US 2. Authorities say the Bad River environmental office and Wisconsin DNR were advised of the crash due to fuel leakage from the semi. The Ashland EMS ambulance transported Sjolander to MMC where she was stabilized and later flown by fixed wing aircraft to a hospital in Duluth. Her condition is unknown at this time. The driver of the semi was not injured in the crash.